Not all is as it appears in Scotland as objects move uphill on their own accord. 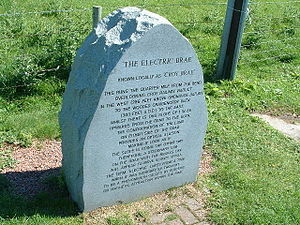 In an area known as the Electric Brae, visitors have been baffled for centuries as they watch the seemingly impossible happen. In what is an entirely natural phenomenon the landscape conspires to trick the eye of the bemused bystander observing movement along an apparent uphill section of road. If one places a ball on the ground and then steps away the ball will start to run uphill. In reality nothing unearthly has occurred. The ball is actually rolling downhill, all be it a very slight angle to the horizontal, and it is the viewer of this apperation that is the actual cause of this oddity of nature.